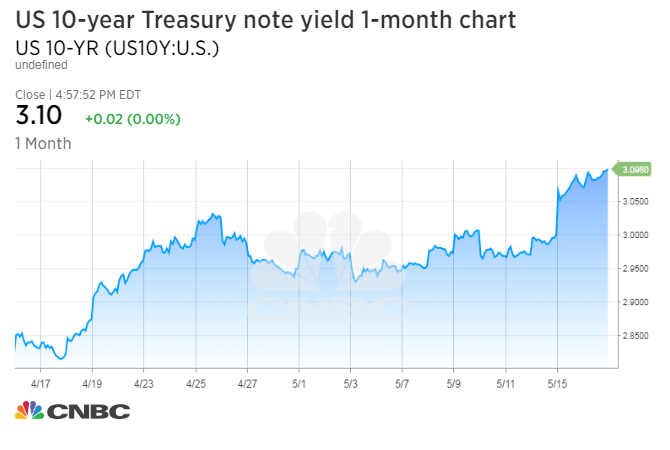 The yield on the 10-year Treasury note hit a new multiyear high Wednesday, topping 3.1 percent for the first time since July 8, 2011. The two-year Treasury note yield also notched a new multiyear high of 2.593 percent, its highest since August 11, 2008. The 10-year Treasury yield ticked higher in late afternoon trading, adding to its sizable climb over the past two days; the rate remains up roughly 10 basis points since Monday morning. The 10-year Treasury rate is especially important given its role in helping set rates for a whole range of business and consumer loans, including home mortgages. The yield on the 30-year Treasury bond was also higher at 3.22 percent. Bond yields move inversely to their prices. The recent climb in yields comes amid a flood of economic data this week. On Wednesday, the Commerce Department said that U.S. homebuilding and permits stumbled in April, reversing March's rise and hinting at a persistent shortage in both land and skilled labor. Housing starts dropped 3.7 percent to a seasonally adjusted annual rate of 1.287 million units in April, the department said on Wednesday. However, data for March was revised upward to show starts rising to a 1.336 million-unit rate instead of the previously reported 1.319 million-unit rate. Building permits fell 1.8 percent to a rate of 1.352 million units, just better than the 1.35 million economists polled by Reuters predicted. Reports on retail sales and factory data Tuesday helped lift the U.S. 10-year yield on Tuesday, in turn weighing on U.S. stock markets amid fears it could undercut stock valuations. The Commerce Department report said retail sales increased 0.3 percent in April, while March's figure was revised up to a 0.8 percent gain. The spending gains were spread broadly across the retail industry, with big gains at furniture and clothing stores. "The fact that retail sales were solid certainly provided a tipping point for 10-year yields, something we expected could happen," wrote Ian Lyngen, head of U.S. rate strategy at BMO Capital Markets. "However, we'll argue that it's the broader expectations of stimulus and growth that have pulled yields this close to key levels." Yields have been on the move higher this month ever since the Fed said on May 2nd that inflation was moving closer to its 2 percent target. Rising inflation, which threatens Treasury prices because it erodes the purchasing power of their fixed payments, puts upward pressure on rates. Earlier inflation expectations led to a rise in interest rates in February, sparking a widespread equity sell-off as stock traders grew nervous over whether the economy was ready for increased borrowing costs. "Sessions like the one on Tuesday are indicative of the unwind of quantitative easing in that asset price moves along with volatility spikes are at odds with what historically have been the recent correlations between stocks and bonds, but consistent in that they represent a reversal of the effects of quantitative easing that suppress volatility and elevate all asset prices," Lyngen added. The Fed next meets on June 12, when it is expected to hike the federal funds rate for the second time this year. Investors are betting the Federal Reserve will keep its aggressive stance even if it unnerves financial markets a bit. Traders for the first time Monday assigned a 51 percent chance of a fourth interest rate hike this year by the Fed, according to the CME Group.